2018 has a been a very good year for Jeannail “Cuddle Core” Carter. Starting in March, her team won ELEAGUE’s inaugural Tekken Team Takedown event. While the events she would hit up throughout the year were limited, her results at them were impressive; placing 13th at Combo Breaker, 17th at Evolution, and 4th at Canada Cup. This past weekend, her airline lost all of her luggage but she still managed to place 4th at the Tekken World Tour Last Chance Qualifier. 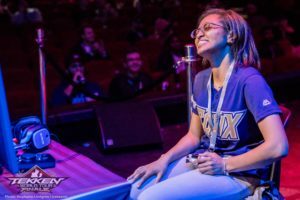 Our Amanda Stevens was able to sit down with Cuddle Core shortly before she left for Amsterdam for the LCQ to talk about her year, signing with Equinox Gaming, and her origins as a fighter. You’ve had a very good year. You did ELEAGUE, the Tekken tournament at the beginning of the year, and you’ve switched teams – you’re now on Equinox. If you were going to try to sum up in a few words what 2018 has been for your fighting game career, what would it be? Unpredictable? Did you ever think that you were going to be selected as one of the team captains for ELEAGUE? I had no idea. I got a text because they had our contact information and they said “Oh, hey, Cuddle. Will you accept being a team captain,” and I said “Yeah, I feel like I shouldn’t pass up on this,” but I also never saw myself as a leader, honestly. I felt like I was just there. But it just naturally happened for me and in the moment, I was able to help out but also be able to listen to my teammates as well. Competing in fighting games is a full-time thing for you, right? What were you doing before? What was pre-full-time fighting game life like for Cuddlecore? As soon as you were done with school, did you just immediately dive into the competitive scene or were you trying to work a real job for a bit? I see you smiling! Well, in the duration of the 6 years that I was in school, I was also competing as well. I was still flown out to events during school breaks so I was competing that whole time. Was this kind of a game plan for you? Did you see other people competing full-time and think “School’s nice and all, but this is what I want to do”? Uh, somewhat, but I always kinda knew that if I had more time to do it, I would have travelled more because I wanted the experience to become better. Seeing other people definitely did motivate me to travel more full-time after school was done. So now that you’re actually living the fighting game dream – you’ve got a sponsor, you get to go to events – is it what you thought it would be when you were looking at it from the outside? I didn’t know what to expect, honestly. I was just always hoping to get a sponsor that understood who I am as a person so I’d never have to change. I’d heard so many horror stories about people getting signed to teams and not knowing what they were getting into that I tried to wait out the time after I left my first team. I wanted to be patient and then Equinox came into my life. So now that you’re a sponsored player and you have a lot of people that look up to you because you are one of the top female fighters overall in the FGC, do you feel like you have to be better or do anything extra because you have that spotlight as a female player? Or do you try to put that out of your mind and just try to be a good player? Just with the second statement that you said, it’s more about just being a good player. I never think about like “Oh, well, there’s another woman who plays the game so I should be better than her.” That’s not gonna do anything for me. It’s about overall being a very good player and comparing yourself to other people isn’t bad, but it needs to be people across the whole board, not just women. I think that actually can be the purpose of people getting better. All I do, honestly, is look at matches of people who play my characters, Americans versus international players, and I take knowledge from that more than anything else. So a lot of people don’t understand what the life of a full-time gamer is. What is your training schedule like? Do you treat it like a 9 to 5 or do you practice when you’re in the mood? What does it look like on the day-to-day for you? It depends on what mood I’m in but every day I boot up tech and I do, I stream it, but sometimes it’s just more fun, and other times it’s more serious. Across the whole time I’m streaming, I’m always learning. There was always a learning moment for me – every single day I stream, which is very often, so it’s like a 9 to 5. Do you like the whole streaming thing and having to do social media engagement? Is that something that comes naturally to you? No, it doesn’t come naturally to me at all but it has become more natural to be the more I’ve done it. Things like just wording and phrasing. Now that I’m with another team, I think about how things might make them look and it’s just… yeah. I’ve kinda learned the game as I’ve gone along. So let’s say you woke up tomorrow and your doctor told you that you can’t play fighters anymore. Oh my god, your face broke. What is the Cuddlecore back up plan? Wow. Well, I would find a way to still get back to the community and to be involved. I’d be a tournament organiser or a commentator, or anything. But I would still also try and find a way to play, even if it was with my feet, I don’t care. Nothing would ever stop me or keep me from being around anything gaming-related. One final question: I know I have a tough time explaining what I do for a living to my dad. What does your family think? And not like “Do they judge you” but more like, do they even process what it is that you do for a living? Well, I told them about my first tournament ever. They were like “That’s okay, yeah, go,” and that was a couple of years ago. But the more I did it and when they saw that I loved it that much, they realised how much it meant to me and they knew what it took. The past couple of years, my parents have done research about it because I inform them about what it’s like and where I go, how I place. And they see for themselves how much is in the gaming community, but that’s only because they’re invested now I love it so much. But they’re very understanding. They’re not judgemental. Honestly, I feel no pressure whatsoever. They want me to do what I want. Do they own Cuddlecore jerseys yet? No, but my mom has my ELEAGUE picture at her desk at work and she says that she’s always so proud of me. And my dad always tells his friends about it. That’s really cute. Do you have anything you want to say to anybody who’s trying to get into Tekken and wants to be you? Like, live the dream? Well, I don’t know if it’s a dream or not. I feel like it’s something that… if you want it, you have to work hard for it. And part of it is a dream but part of it is a reality and that for anything you want in your life, you have to work hard. For anything. And second, Tekken especially, that game is deep. The mechanics, the techniques. But if you really love anything, always work hard at it. Ask questions. Never be afraid to ask questions because I think people always fall short on that. And there’s nothing wrong with idolising but always remember: you can be just as good as that person and don’t let that get to your head.